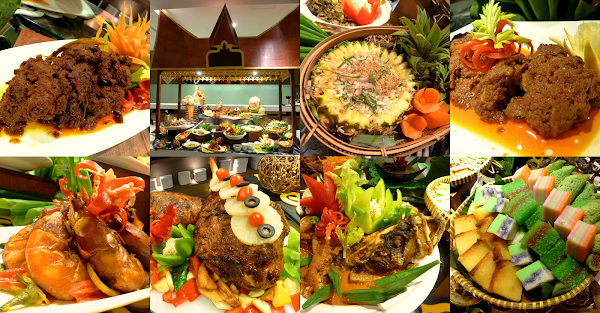 Olive Tree Hotel is the first hotel to showcase its Ramadan buffet dinner this year. Held at Sukkah Coffee House, today's preview reflects this year's theme: Minangkabau cuisine. For reference, Sukkah focused on Middle-Eastern food last year. Minangkabau people are indigenous to West Sumatra in Indonesia, including the provincial capital of Padang. In Malaysia, there is substantial Minangkabau diaspora in Negeri Sembilan. As common in Minangkabau architecture, buffalo horns are featured prominently in tonight's dinner event. For starters, Nasi Ulam is essentially steamed white rice mixed with kerisik (grated and toasted coconut), salted fish, daun kaduk (wild betel leaf) and onions. The mixture is served in a bowl made by a hollowed out pineapple. Kerabu Jantung Pisang is a salad mixture of jantung pisang (banana flower), belacan (shrimp paste), ikan bilis (anchovies), grated coconut, onion and red chili peppers. Only the core of banana flower is used. The flower is cut into thin slices and then boiled in saline water until it becomes soft. All ingredients are combined in a mortar with salt and sugar added to taste. Ulam-Ulaman Serantau is a collection of vegetables that are typically eaten raw. Examples of raw vegetables are kacang botol (winged beans), long beans and ulam raja (king's salad). To compensate for the lack of flavor, ulam is typically served with condiments such as sambal belacan, cincalok and budu. Tempeh, an Indonesian soybean delicacy, is also available. Sup Ayam Cendawan combines the savoriness of mushrooms and chicken, making the soup very appetizing indeed. Lemongrass serves to soften the taste to a certain agree, such that the soup does not feel too surfeiting. Minangkabau dishes are generally spicy even by Malay standards. This is attributed to liberal use of chili peppers in Minangkabau recipes. An iconic example is Rendang Daging Minang, a spicy beef dish which is seasoned with flavorful spices such as ginger, onions, star anise, chili peppers and lemongrass. Also included in the curry are grated coconut and coconut milk to enhance creamy appeal. To present a more diverse range of food, there are also Malay dishes from other states such as Kambing Masak Kerutuk. This mutton dish from Kelantan also hinges upon flavorful spices just like the beef. Spices are particularly crucial when preparing mutton due to the meat's powerful odor. Ayam Masak Ros is a poultry dish which is cooked with tomato sauce and several spices like turmeric (kunyit). Contrary to its name, this dish does not contain rose flowers. Instead, the name actually refers to the reddish gravy. Satay is a popular street dish in Malaysia. Chicken is marinated with turmeric, skewered and then grilled over hot charcoal. Satay is typically served with cucumber, onions and nasi impit (pressed rice). Devoted carnivores will find it difficult to resist the temptation of Roasted Lamb. Although only a limb is prepared today, a whole lamb will be served every evening during Ramadan. In rural areas, it is not uncommon for the community to roast whole lambs for everyone to enjoy. Moving to seafood, Ikan Bakar is a sea bass (siakap) grilled to golden crisp. The fish is basted with savory paste made of coconut milk, turmeric, ginger, onions and other spices. For Gulai Ikan, the sea bass is fried beforehand, and then served in a claypot of curry with okra (lady's fingers). Unlike Penang's recipe, this dish does not rely so heavily on asam (tamarind). The curry is also less creamy because it does not use as much coconut milk as its local counterpart. If you are fond of tiger prawns, Udang Goreng Kunyit is probably your cup of tea. The prawns are marinated in turmeric powder and then stir-fried with onions and chili peppers for the aromatic appeal. Sambal Ikan Bilis Petai is an interesting delicacy indeed. The savory blend of anchovies and chili paste makes it suitable to eat with steamed rice. More importantly, the dish also contains petai (stink beans). Petai is notable for its distinctive smell. One of my favorite highlights tonight is Pucuk Paku Masak Lemak Cili Api. For this dish, pucuk paku (vegetable fern) is cooked in creamy gravy made from coconut milk and turmeric. Bubur Pulut Hitam is a dessert made from black glutinous rice. Typically, coconut milk is added too. Meanwhile, Badak Berendam are round dough balls cooked in coconut milk. The balls are filled with sweet coconut grating and also flavored with pandan juice, giving them the distinctive green color. A common feature of Ramadan dinners is the wide range of traditional Malay kuih. Types of kuih presented today are kuih dadar (grated coconut crêpes), kuih lapis (layer cake), kuih sago (sago cake), kuih salat (pandan custard & glutinous rice cake) and kuih bingka ubi (tapioca cake). 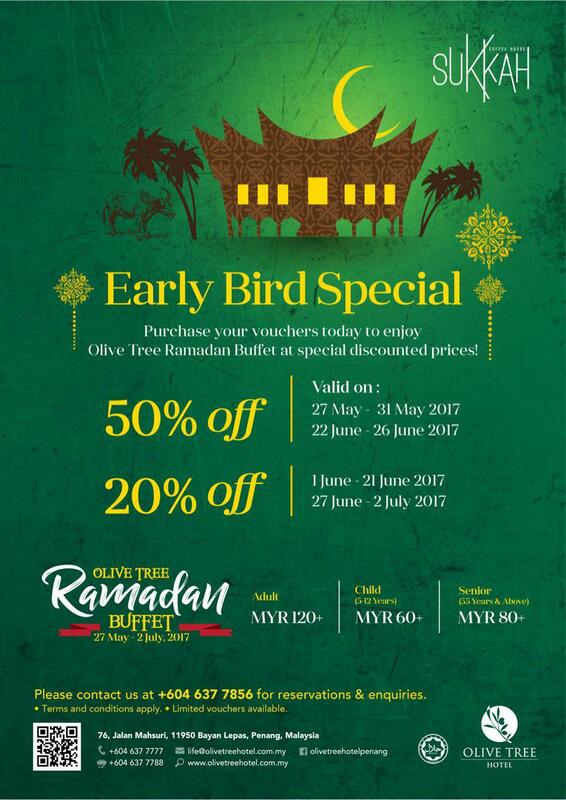 Olive Tree Hotel's Ramadan buffet dinner is served from 27 May 2017 to 2 July 2017. Today's preview event only showcases a subset of dishes available during the actual dinners. The normal price is RM120.00+ for adults, RM60+ for children, and RM80+ for senior citizens. Early birds who confirm their purchases before 8 May 2017 will enjoy up to 50% discount. There are limited vouchers, so act quickly to take advantage of this offer.